At OneDesk, we know how difficult task management can be, especially if they are distributed across various departments or organizations. Therefore, we have developed several task management capabilities that will make your job easier. By entering tasks into OneDesk, it’s easy to keep track of them and get notified when team members update them. Tasks can be created from scratch, or created from requirements. They can also be linked to requirements. This is useful because every team member can trace back to any task’s origin and understand why they are working on it. This facilitates task management, and puts the entire team on the same page. You can import your Microsoft Project files, and continue working on them in OneDesk. The primary advantage of this is that with OneDesk, all users are interconnected. Every team member can view the project, enter their own data and update projects themselves, depending on their permissions level. OneDesk also features real-time collaborative editing, which allows users to see what other users are currently working on. Users can use the discussion forums or instant messaging tool to collaborate and initiate quick conversations to resolve questions. Learn more about the advantages of working on Microsoft Project files in OneDesk here. OneDesk comes with an innovative assignment scheduler that allows you to view the tasks each team member is working on and see who is overloaded with tasks, and who does not have enough tasks. It’s easy to move, evenly distribute and re-assign tasks; simply drag and drop. Learn more about OneDesk’s assignment scheduler here. OneDesk features an interactive Gantt chart that makes it easy to track and compare your projects. It is very similar to the one in Microsoft Project, and very easy to learn to use. Simply drag and drop to create links and predecessor-successor relationships between tasks. 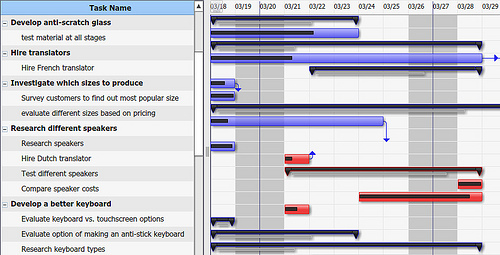 Learn more about OneDesk’s Gantt chart here.